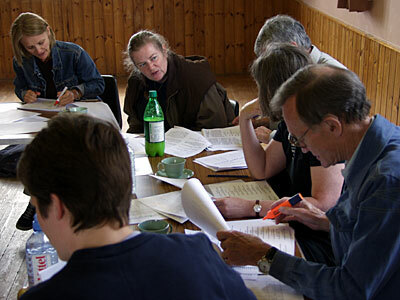 On Saturday 3rd July 2004, a group of 14 readers assembled at Milton Keynes Village Hall for SCTC’s latest project – “Under Milk Wood” in a day! Gathering at 12:00, we sat down to discuss how we would proceed through the day. 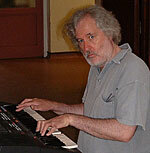 Jeremy had spent many hours working out possible schemes for casting the play – containing over 70 different characters. This proved a near impossibility for our particular project. Therefore, Jeremy decided that the best way was for the men and women to rotate through the different characters, with each person taking a character for one of the 31 identified scenes. In this way, we all got to read a variety of parts and I think everybody got to read the main narration parts of either First and Second Voices. The part of Second Voice was read by the female voices to add a better balance to the amount of reading we all got to do. The afternoon was spent reading through the various scenes with the readers flowing between different groups working on particular parts of the script. Jeremy moved between these making suggestions here and there about meanings and dramatisation. If you have never read it, “Under Milk Wood” is a very funny play. For the first time, I found that it made sense to me and I, as everyone, had a good deal of fun with it. As time progressed, we formulated how we would actually arrange the reading for the evenings performance and read through a progression of some of the scenes. As a deliberate decision, we did not read the whole play through for the first time until we performed it that evening. This was to keep the whole reading fresh, and add that little excitement of reading some parts for the first time in performance! We broke for a group meal at around 18:00 – mounds of pizza, quiche, salad and bread had been brought along by us all, allowing for a nice relaxed refuel before the performance. The day was never intended to produce a thoroughly polished performance reading, but to be the result of some 6 hours of discovery and enjoyment by the readers, allowing them to interpret and confidently read the work. As it happens, I believe that we achieved a high standard and the small audience appreciated our work. In summary, this was a very good day – expertly organised and led by Jeremy Cooper. I think that readings, in some format, should definitely form part of our future ventures.